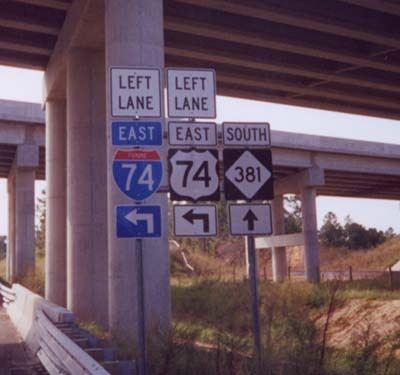 The freeway has exit numbers matching US 74's mileage which run from 319 at the NC 38 interchange to 321 at Business 74 (the map above incorrectly lists the last exit as 322), for more information go to the I-74 Exit List. A law that passed Congress in 2012 at the request of Texas transportation officials for I-69 would allow states to sign as full interstates, routes already up to interstate standards, but not connected to another interstate. It is unknown whether NCDOT will take advantage of this law and sign this part of the Bypass as Interstate 74, however no signs had been changed by the end of 2016. In actuality, NCDOT removed the Future I-74 signs up since the Bypass was opened. 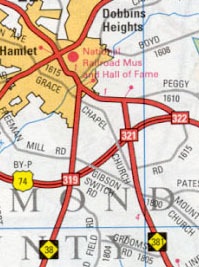 Perhaps due to the route being erroneously signed as I-74 in the NCDOT 2017-2018 State Transportation Map (see I-73 Segment 12) and in the 2018 Rand McNally Road Atlas. It appears probable that no new I-74 shields, either future or actual, will now appear on the Bypass until the completion of the I-73/I-74 Rockingham Bypass (see I-73 Segment 11). 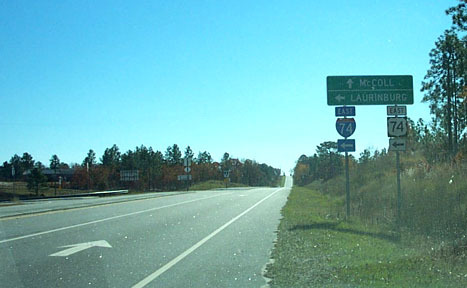 A photo (from May 2009) of the NC 381 exit from the US 74 Rockingham Bypass freeway courtesy of James Mast. Signage at the NC381-Future I-74/US 74 interchange. (November 2002) The East Future I-74 sign was removed in the fall of 2016. 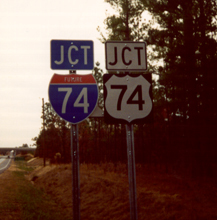 Sources: ADC North Carolina Road Atlas, 2005 *NCDOT removed Future I-74 shields that accompanied US 74 reassurance markers in the fall of 2016. (1) Former NCRoads.com I-74 page. Interstate and US 74 shields courtesy of David R. Kendrick's Shields Up!